As your emerging eCommerce brand continues to mature within the world of online retail, it’s important to identify and implement best practices for growth and expansion. What processes and procedures will help bring you to the next level? What are the right partnerships to invest in? 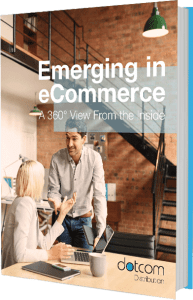 Our new eBook, “Emerging in eCommerce: A 360° View From The Inside,” will help you answer these questions, and more. This roadmap for emerging brands contains tried-and-true tips and exclusive interviews with industry experts.